Congratulations on accepting our Energy Challenge! Any individual, school, and organisation that registered Accept the Energy Challenge 2018 and managed to cut its electricity consumption by 1% over a minimum six-month period in 2018 (when compared to corresponding months in 2017) will be acknowledged List of Energy Challenge 2018 Winners. 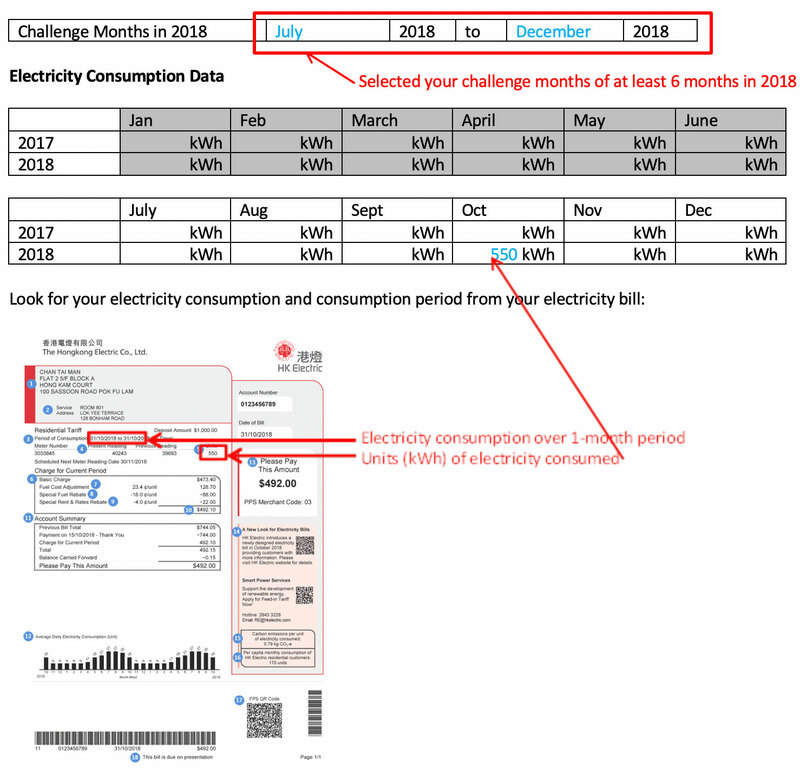 A reduction of 1% of total electricity consumption over a miniumum six-month period in 2018 (when compared to corresponding months in 2017) is your target! You will need electricity bills received in 2017 and 2018 for entering your electricity consumption Submit Electricity Consumption. Refer to our guide if you encounter problems during data entry. If you have lost some of your electricity bills, we will help estimate the missing consumption on your behalf. Your name will be listed on our webpage if you achieve the target of 1% reduction of total electricity consumption. If your electricity consumption reduction is far greater than other challengers, we may contact you to ask that you share how this was achieved, and to celebrate your success during our Earth Hour 2019 launch ceremony. In the spirit of fairness, we may request that you provide us with copies of your electricity bills. Feel free to contact us (852) 2526 1011 if you have any questions. 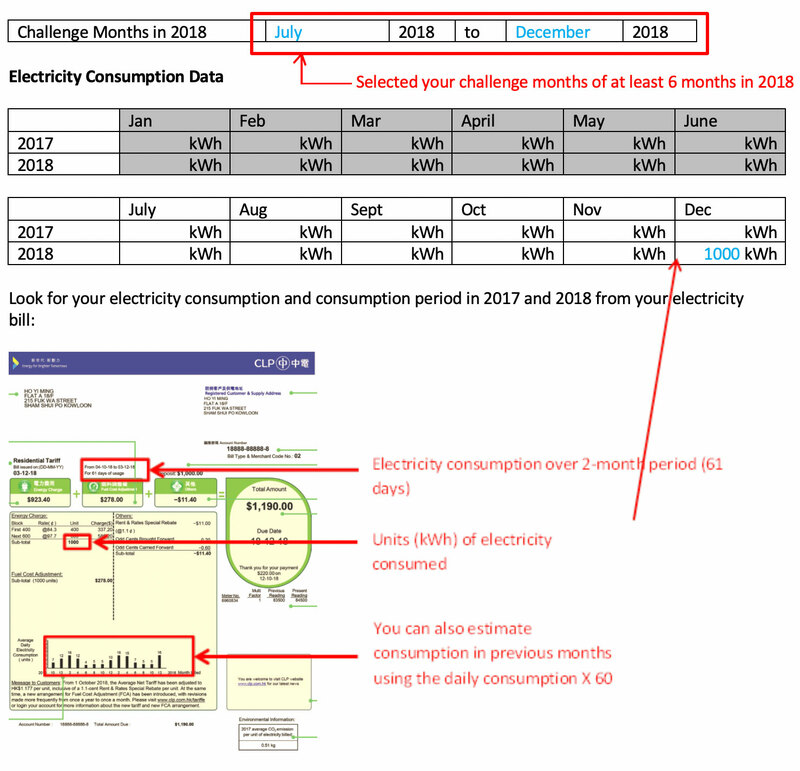 A reduction of 1% of electricity consumption (total/ per capita/ per floor area) over a minimum six- month period in 2018 (when compared to corresponding months in 2017) is the target for your school! For the challenge, you will need electricity bills received in 2017 and 2018 for entering electricity consumption Submit Electricity Consumption. Refer to our guide if you encounter problems during data entry. If you have lost some of your electricity consumption records, we will help estimate the missing consumption on your behalf. We will list your school on our website if you achieve the target in the category of challenge(s) that your school selected. If your school achieves significant electricity reduction compared to other challengers, we may contact you to share with us how your school achieved this, and to celebrate your school’s success during our Earth Hour 2019 launch ceremony. In the spirit of fairness we may request that you provide us with copies of your electricity bills/metering records. A reduction of 1% of electricity consumption (total/ per capita/ per floor area) for a minimum six-month period in 2018 (when compared to corresponding months in 2017) is the target for your organisation! For this challenge, you will need electricity bills received in 2017 and 2018 for entering electricity consumption. Submit Electricity Consumption. Refer to our guide if you encounter problems during data entry. If you have lost some of your electricity consumption records, we will help estimate the missing consumption on your behalf. The name of your organisation will be listed on our website if your organisation achieves the target set within the category of challenge(s) selected by your organisation. If your organisation achieves significant electricity reduction compared to other challengers, we may contact you to share your corporate’s/organisation’s energy-saving strategies, and to celebrate your organisation’s success during our Earth Hour 2019 launch ceremony in March. In the spirit of fairness, we may ask that you provide us copies of your electricity bills/metering records. The above is for reference only. The actual energy saving depends on the power input (wattage) of a particular appliance. Use natural lighting and light zoning in the home/school/office. This means turning off lights near windows during daytime. Make sure the light switches are individually marked so staff and students know which switch is for which lights. Ensure energy-saving settings (eg sleep mode) is used on computers and other appliances. Set the air-conditioning (thermostat setting) to 24 degrees Celsius in the winter and 26 degrees Celsius in the summer. Choose energy-efficient electrical appliances. A Grade 1 room air-conditioner of 1 Horsepower could save up to HK$480 in electricity cost annually compared to a Grade 5 model. A Grade 1 refrigerator can save up to $380 per year. You can calculate the electricity running cost of air conditioners, refrigerators, washing machines, dehumidifiers, televisions, water heaters, etc. based on the brand and model, from the EMSD’s website. Fully load the washing machine as half loads use the same amount of energy as a full load. Clothes ironing uses up to 1,800 watts of energy, and consumes up to 1.8 units of electricity if used for one hour. Remove clothes promptly from the washing machine to minimise ironing needed. T5 fluorescent tubes consume 20% less power than T8 fluorescent tubes. Use 7-day time switch to turn off all office equipment after office hours, which can add up to 5-20% in energy savings. Choose the variable frequency drive (VFD) for air-conditioning systems. By reducing air or water flow rate by 20%, the VFD can save up to 50% of energy. Use heat pumps to act as a source of hot water supply. Compared to electric and gas heating, heat pumps use about 35-50% less. If you have problems reading our bill you can visit CLP’s website. Please contact us directly if you have problems with data entry (852) 2526 1011.